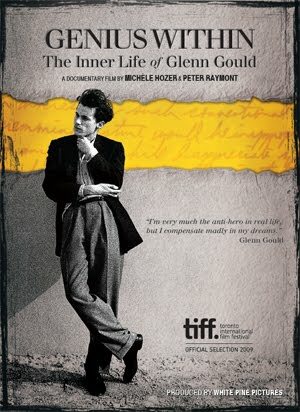 In my haste to post last week's blog entry which was already late, I forgot to mention the Toronto screening of Genius Within: The Inner Life of Glenn Gould, the new documentary on this most enigmatic of Canadian cultural icon by filmmakers Michele Hozer and Peter Raymont. I attended the second screening last Thursday at the Royal in downtown Toronto. The filmmakers were there to introduce the documentary, as was Professor Mark Kingwell, who penned the newest Glenn Gould book, as part of the Extraordinary Canadians series on Penguin Books. Gould has been an endless subject of scholarly and popular works, and this film goes a long way in answering some of the many questions about Gould the man, with all his complexities and eccentricities. The film was screened at the TIFF last September. The filmmaker Michele Hozer mentioned at last Thursday's screening that it will be shown on many arts channels, including Arte in Europe and PBS in the United States. The screenings in Toronto ended yesterday, but you can still catch it in Waterloo (Jan. 27-28), Ottawa (Feb. 3), Barrie (Feb. 6 - 8), and Collingwood (March 29). I understand the film is not yet available on DVD, but I imagine it will be at some point after its run of international screenings are completed. Highly recommended. A main interest this week is the world premiere of a Toronto Symphony Orchestra's co-commissioned piece, The Four Seasons by composer Philip Glass. This intriguing new work is billed as Glass's re-imagining of Vivaldi's Four Seasons. Also on the program is Beethoven Symphony No. 6, 'Pastoral'. Two performances on the 9th (8pm) and 12th (7:30pm). The Saturday 12th show is a "casual concert", without an intermission and with lobby entertainment after the show. Of course the season of Christmas choral music is just beginning. There are multiple offerings on each day of the week, so I won't try to be comprehensive about this! On Wednesday December 9 at the Yorkminster Baptist Church on Yonge Street is Mendelssohn Choir's Ceremony of Carols, featuring Judy Loman (harp). On Thursday at the George Weston Recital Hall, Toronto Centre for the Arts in North York, it's the Toronto Philharmonia and their Carol for Christmas -rather clever play on words I thought - with jazz vocalist Carol Welsman. On Friday, December 11 (2 shows 4 and 8pm), you can catch the Moscow Boys Choir in Christmas Around the World at the Oakville Centre for the Performing Arts. Or you can choose to attend Oakville Choral Society's performance of Vivali's Gloria at the Glen Abbey United Church at 7:30 pm. There are at least two Messiahs this week, one presented by the Brott Musical Festival at the St. Christopher Anglican Church in Burlington on Saturday December 12 at 7:30 pm. The second one is The Dublin Messiah, presented in its "original version" by conductor Kevin Mallon and his Aradia Ensemble at the Glenn Gould Studio on Saturday, December 12 8 pm. Soloists are Laura Albino, Marion Newman, Nils Brown and Sean Watson. GENIUS WITHIN: THE INNER LIFE OF GLENN GOULD will be shown one more time at The Royal Cinema, 608 College Street, Toronto on Tuesday December 8 at 9:30 pm. Catch it in a theatre while you can. It is definitely worth the effort. Many thanks for the information. I am so glad that there are two more screenings. I found myself deeply moved at the end of the 109 minute documentary. I encourage everyone to go see it!